MOST and Microsoft Fax Plug-ins must be configured before installing. 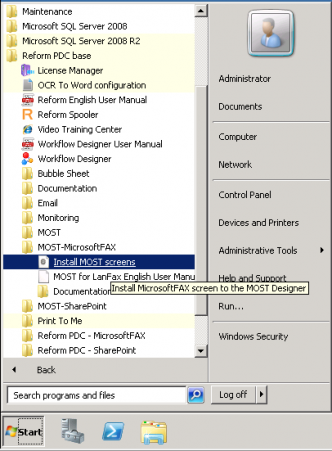 To install MOST Microsoft Fax to your existing Reform installation, you will need to download and run the Reform-MOST-MSFAX.exe installation executable. Step through the prompts, and the installation will begin. 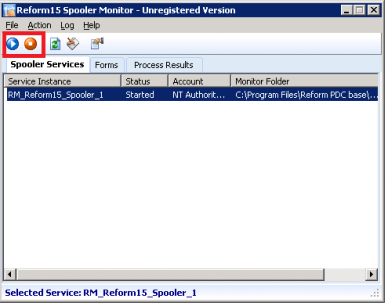 After you have completed the installation of MOST Microsoft Fax, the Reform Spooler Service must be restarted. Open up the Spooler by going to Start > Programs > Reform… > Spooler. Highlight the Reform Spooler instance that should be restarted and click the red stop button and then the blue start button. 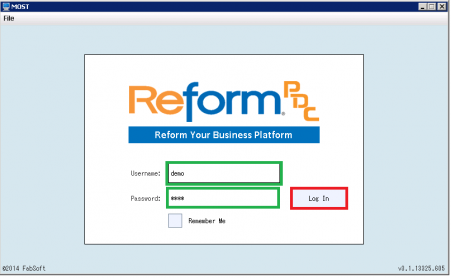 The default installation directory for Reform and its Plug-ins is C:\Program Files\Reform…\. If you have changed the path during the Reform installation routine, please refer to the appropriate path instead of the default one referenced throughout this documentation. Please refer to the MOST manual for more information regarding Most terminology and Setup. If not already open, the MOST Designer will appear and you will be prompted to import the screens. Click Yes. We need to setup the communication beween MOST and Microsoft fax. To do so, we have to configure certain parameters in MOST’s Global variables screen. If the MOST Designer is not already open, go to Start > Programs > Reform… > MOST > Designer. Select the variable, enter its value in the provided box and then click the update button. The CommunicationType global variables uses a drop down list with available options for your convenience. *CommunicationType specifies whether or not the MFP is reachable by IP from the MOST server. If the MFP is reachable by IP from the MOST server, the CommunicationType should be set to "Local". If the MFP is on a remote (wide area) network, the CommunicationType should be set to "Remote". 6. Variable Name = MsFaxServerName Value= The name of the fax server. If the Reform/MOST server is the fax server (where the modem is installed), this field should be left blank. to save all the global variables. icon to add the MSFAX collection. The emulator shows you exactly what you would see on an MFP, and it functions in the same way. This same process could be tested with the same exact steps, but by installing MOST on the MFP by following the instructions in the MOST manual. 1. Login to MOST at an MFP or use MOST Desktop (Start > Program > Reform… > MOST > Misc > MOST Desktop) using the username and password for which you gave the MSFAX collection to. In the tutorial, we configured the user demo, password demo. (You can also log in as a domain account if the MSFAX collection was assigned to Domain users in the previous steps.) Click Log In. 2. The emulator will now connect to the MOST server and login. Once it logs in, you will see a series of collections and tabs. For this tutorial, we will be using the MSFAX collection and tabs which you have made available to the user. 3. 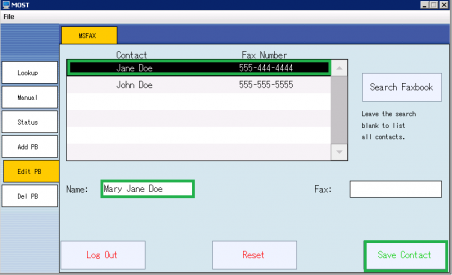 From your MSFAX collection you will see the Contacts screen which allows you to fax documents to multiple recipients. 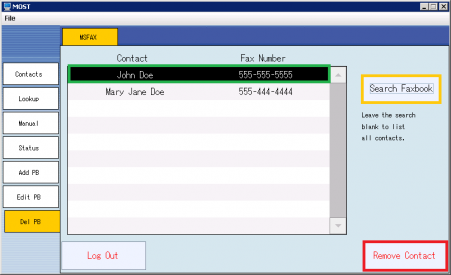 Click on the Search Faxbook button to display your LDAP and Outlook contacts. Leaving the search field blank will display all contacts. The text entered for the search should be in the format of either "Lastname" to find any contacts with a last name beginning with the entered text or "Firstname Lastname" to find any contacts with a first name beginning with the first word and last name beginning with the second word. 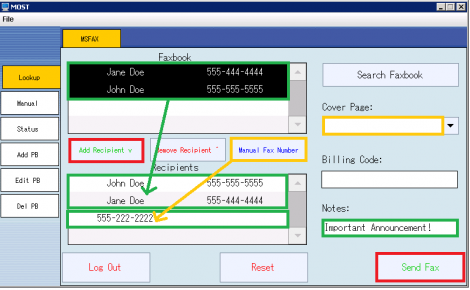 Select your contacts from the Faxbook list and click on Add Recipient button to populate the Recipients box. You can also use the Manual Fax Number button to enter a fax number using the onscreen keyboard. To use a cover page, select one from the combo box. To send the document, press the Send Fax button and scan a document. Note: To search LDAP or Outlook contacts, MOST must be configured for LDAP authentication. Also, to search Outlook, Exchange 2007-2013 is required and the user must log into MOST with their domain credentials. 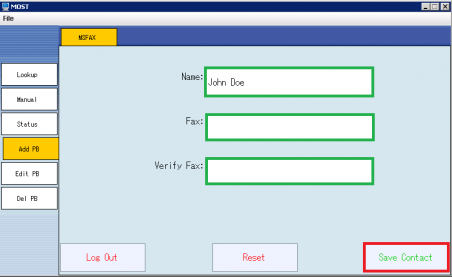 For environments without LDAP or Exchange, The Lookup screen may provide better functionality as it allows users to maintain their contacts at the MFP screen without any additional requirements. 4. On the left, click on the Lookup tab. 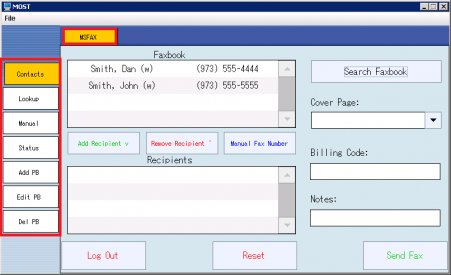 This screen is similar to the Contacts screen however users may maintain their contacts directly at the MOST screen. It does not require LDAP or Outlook/Exchange. Click on Save Contact to add the contact. Click on Save Contact to add the contact to the phonebook. 6. On the left, click on the Lookup tab to return to it. 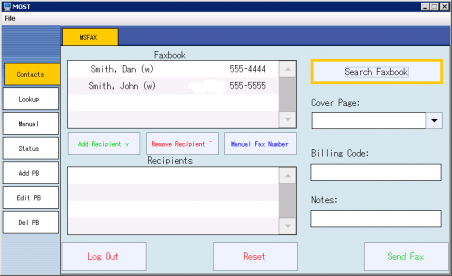 Click on the Search Faxbook button to display your personal contacts. Leaving the search field blank will display all of the available contacts. 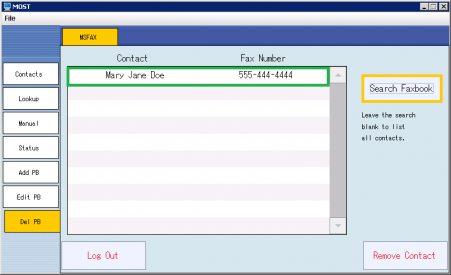 Select your contacts from the Faxbook list and click on Add Recipient button to populate the Recipients box. You can also use the Manual Fax Number button to enter a fax number using the onscreen keyboard. Next, on the Notes field type in "Important Announcement!". To use a cover page, select one from the combo box. 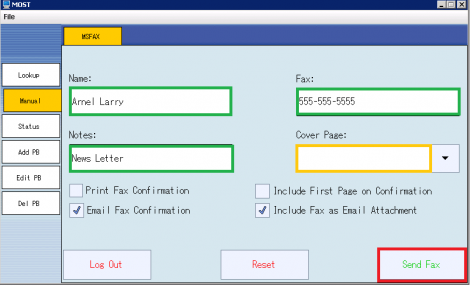 To send the document, press the Send Fax button and scan a document. 7. 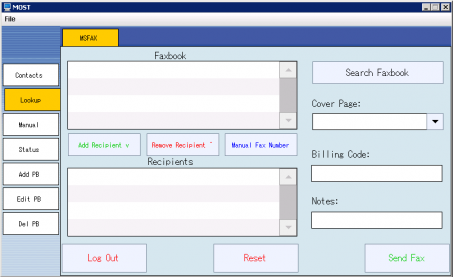 We want to send another fax, this time using the Manual tab which lets us manually enter fax information. On the left, click on the Manual tab and fill out the fields. Check the checkboxes for the type of confirmation you wish to receive. For this demo, an email confirmation with the fax as an email attachment has been selected. To use a cover page, select one from the combo box. To send the document, press the Send Fax button and scan a document. Note: In order to receive an email, the Email Plug-in must be installed. 8. Wait a moment and then click on the Status tab on the left hand side to view the status of your fax. 9. A MFP is required to print the status. From your MFP, select your document from the list. Then, click Print Status to print the status of your fax followed by the original document. 10. On the left, click on the Edit PB tab, and select Jane Doe to be edited. If your list is blank, click Search Faxbook and leave the search field blank to search all contacts. We will edit the following fields by replacing with these new values: Name = Mary Jane Doe. Click on Save Contact. Wait a few seconds and click on Search Faxbook to refresh the list. You should be able to see the changes you made. 11. On the left Click on the Del PB tab. Click on Search Faxbook to refresh the list if it does not have the latest changes you made in the previous step. 12. Select John Doe and click on the Remove Contact button to delete from the List. Click on Search Faxbook to refresh the list (leave search blank). Mary Jane Doe should be the only one left in the list. For Windows 2012 the Cover Page file (.cov) should be stored in "C:\ProgramData\Microsoft\Windows NT\MSFax\Common Coverpages\en-US\". For Windows 2008 the Cover Page file (.cov) should be stored in "C:\ProgramData\Microsoft\Windows NT\MSFax\Common Coverpages\en-US\". For Windows 2003 the Cover Page file (.cov) should be stored in "C:\Documents and Settings\All Users\Application Data\Microsoft\Windows NT\MSFax\Common Coverpages\". There are certain directories and SQL tables that need to be monitored for growth along with the Microsoft Fax Plug-in for Reform. As a system processes more and more jobs, the size of these directories and SQL tables can grow very quickly. Overall system performance can be affected by the large amounts of space that the files may take up. Also, there exists a 10GB database limit if using the Microsoft SQL Server Express supplied with this installation. Obsolete files/database entries should be deleted according to your needs and file retention specifications. Q: Faxes are not reaching the Microsoft Fax printer. A: You may have to restart the RM_MicrosoftFax Service. 2. 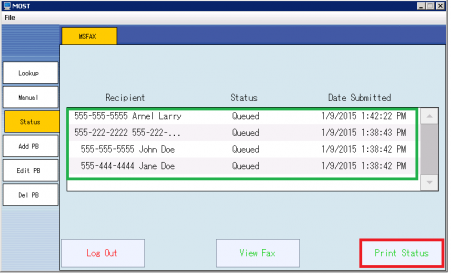 Find the service RM_MicrosoftFax. 3. Confirm the service account is correct and has access to the Fax driver and server. 4. Right-click on the service and click Restart. This will cycle the fax service. 5. You may close the Services panel. Try sending another fax. You should see it briefly enter the queue of the Microsoft Fax printer before it is processed. If still not working, make sure you can manually send faxes to the Microsoft Fax Printer driver before configuring Reform to do so. This page was last edited on 10 November 2017, at 16:33.